The Cary location’s expansive interior features vibrant-colored walls and even a yellow-brick-road inspired floor. Distinctive framed artwork and exquisite custom-blown glass hang from the ceiling. Never mind a year-round outdoor patio with seating for 100 patrons. 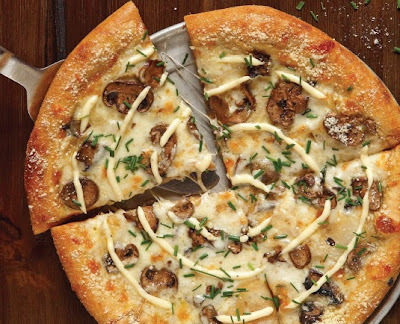 Mellow’s pizza crust elevates its pies to near-addictive status. The secret behind the shell? It’s small-batch made with whole-wheat grains, and molasses is a key ingredient rather than refined sugar. Must-try specialty pie Holy Shiitake, albeit edgy, will rock your world. Consider the flavorsome blend of locally obtained shiitake, button and portobello mushrooms on an olive oil and garlic base. What’s more, the pie also is suffused with truffle oil, caramelized onions and MontAmore cheese. Fresh-cut chives are added after it comes out of the oven. Another pie worth consideration is Thai Dye, which features an olive oil and garlic base, grilled curry chicken, mozzarella, Roma tomatoes and onions. It’s heaped with fresh basil, cucumbers and a swirl of Thai chili sauce. The menu also features an array of calzones, hoagies and salads, but it’s unlikely you’ll ever never find Lunchboy venturing off the pizza path.